Dominique Lapierres City of Joy, the city of Kolkata, formerly known as Calcutta is more than 300 years old. This span has witnessed its development into one of the worlds most densely peopled metropolises. And yet, there is something undoubtedly special about Calcutta. For, it combines the past and the present on a covetous plane. It amalgamates the traditional and the modern, and brings the intense and the frivolous together. At one level Calcutta is always in transition, and at another, it is firmly anchored to a tradition and culture quite uniquely its own. Kolkata or Calcutta is the current capital of the state of West Bengal, and was also the first capital of the British in India. It was established in 1686 when the British shifted their operations to the small villages of Govindpur, Sutanati, and Kalikata from their trading port of Hooghly. It flourished and prospered until in 1756 Siraj-Ud-Daula (Nawab of Bengal) attacked the town and drove the British away. Lord Clive then later regained control of Kolkata and until 1911, it remained the capital of the British government in India. Having been the centre of power of the British for so long has given Calcutta a unique culture and heritage, that is quite unlike any other city in India. Some of the important travel sites in Calcutta are listed below. » The Victoria Memorial - The Victoria Memorial was built by Lord Curzon in memory of Queen Victoria and is a fine huge white-marble structure. It is now a museum that houses the most impressive collection of memorabilia from the days of the Raj. 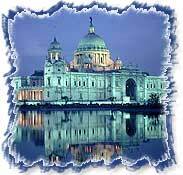 Victoria memorial is one of the most important Calcutta travel attractions. » The Howrah Bridge - The Howrah Bridge is a 450 m long bridge without any pylon in the river and has the distinction of being the busiest bridge in the world catering to around 100,000 vehicles and innumerable pedestrians. It is an excellent example of engineering techniques of the early 20th century. 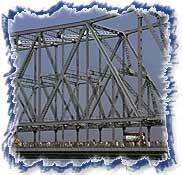 One has travel through Howrah bridge to reach Calcutta from Howrah. » Eden Garden - Eden Garden is a small and pleasantly laid-out garden that was once the gathering place of the social elite. It today houses the renowned cricket ground by the same name. » The Kali Mandir - Also known as Kalighat, the Kali Mandir is dedicated to Kali, the Goddess of destruction and is a frequented tourist destination. » Fort William - Fort William was constructed in 1781 and is still in use. The large patch of green around the fort is known as the Maidan (ground), or the lung of Kolkata. It stretches for a distance of 3 km and is 1 km wide. 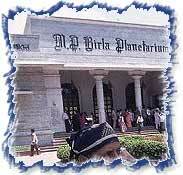 » Birla Planetarium - The Birla Planetarium is a single-storied circular structure that is one of the largest of its kind in the world. Its central dome is an imitation of the Buddhist stupa at Sanchi. » Marble Palace - The Marble Palace exhibits art forms of Italy, the Netherlands, England and other European nations. The interiors of the palace-the floors, walls, and tabletops-are all made of marble. » Indian Museum - The Indian Museum is the oldest museum in India, which was built in 1874. The entrance to the museum has an original Lion Capitol, the national symbol of India and the museum itself is home to a rare collection of artefacts. » Dalhousie Square - Dalhousie Square, which was renamed Binoy Badal Dinesh Bagh (also BBD Bagh), is the hub of West Bengals administration and commerce. All important government institutions of the state are located here. » Shanti Niketan - Shanti Niketan, Tagores university township, is a must on any itinerary that plots Bengal as a stopover. The hot springs here are famous for curing many chronic diseases. » Belur Math - The Belur Math is the headquarters of Ramakrishna Mission. It is a universal place of pilgrimage, visited by people belonging to diverse castes and creeds. It is committed to social service, religious harmony, spiritual attainment and renunciation. » Dakshineshwar Temple - The Dakshineshwar Temple is dedicated to Goddess Kali, and was the dwelling place of Ramakrishna Paramhansa, the spiritual guru of Swami Vivekananda, most of his life. » Botanical Gardens - The main attraction of the Botanical Gardens, which cover an area of 110 hectares, is a 250-year-old banyan tree (Ficus bengalhensis), which is 98 feet high and over 1,300 feet in circumference. » Bishnupur - Bishnupurs is renowned for its crafts such as intricate Balucheri saris, the rare ganijifa (circular Indian playing card), delicate carving on shells and bell metal artefacts. It has a rich architecture, music tradition and handicraft legacy of pottery and weaving. Some unique terracotta temples can be found here. Kolkata is well connected with direct domestic airlines services to and from Kolkata to Delhi, Mumbai, Chennai, Patna, Varanasi, Lucknow, etc. there are also direct flights to most of the countries in the Southeast Asia. The airport is situated at Dumdum, about 17 km northeast of the city center. Trains from the other parts of the country connect Calcutta. The city has two major railway stations-one at Howrah and the other at Sealdah. Kolkata is also connected with most of the Indian cities by road. We offer complete Travel to Kolkata (Calcutta) and Tour Packages Kolkata (Calcutta) to the versatile city of Kolkata that are inclusive of hotel booking, air booking services as well as cab and car hire services for the entire duration of your stay there. Our Kolkata tour packages are convenient and cost effective travel options that offer you unique opportunities to get an insight into the heritage and culture of this old city. Kolkata can justly be described as the shopping paradise for those who want excellent bargains. For, Calcutta is teeming with markets, which might be crowded and dusty, but have their own history and specialize in exotic and unique items. The Calcutta Book Fair is the largest book fair in Asia and provides ample opportunities to explore the fascinating world of books. It is held in the month of January or February every year. The city has uniform temperature throughout the year due to proximity to the sea. Temperature range from 12-27°C in the winter and 24-38°C in the summer. Humidity can be very high during the summers.